The starting point for the Great Confrontation is the run up to Dyrrhachium, which we have discussed previously, so we’ll begin with Caesar’s retreat from that inconclusive battle. 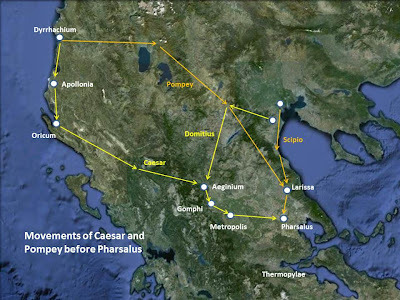 Caesar headed south to Apollonia and the Oricum, where he cared for his wounded, paid the troops, and accumulated grain. Suspecting Pompey might follow, Caesar sent the baggage train out each sunset, following at daybreak with his troops unencumbered in case of attack. Pompey attempted pursuit but abandoned the effort after four days in favor of a different tactic. You can examine the following map to see the movements of Caesar and Pompey as they danced before the final battle. Caesar’s plan was to hurry to Domitius who was shadowing Scipio in Thessaly. Pompey read Caesar’s mind and began a march to Scipio. Domitius foraging west ran into advance scouts of Pompey who bragged Pompey’s plan to him. Sensing danger to himself, Domitius diverted south to join Caesar at Aeginium. Pompey had spread the lie of a total victory at Dyrrhachium, endangering Caesar’s march east, because cities would not open their gates to him. Gomphi resisted and sent word to Scipio saying they were strong enough to hold out until his rescue, but Caesar took the city in a 24 hour siege and plundered it as an example. The next town, Metropolis wisely embraced Caesar as a friend and opened its doors to him. Meanwhile, Scipio diverted to Larissa and requested that Pompey join him there. Pompey’s speeches to his troops were so full of confidence his commanders got into arguments about the offices and villas they would commandeer after returning to Rome, following the defeat of Caesar. Caesar evolved a plan to entice Pompey to battle, not knowing that Pompey’s lieutenants had already pushed him to engage. 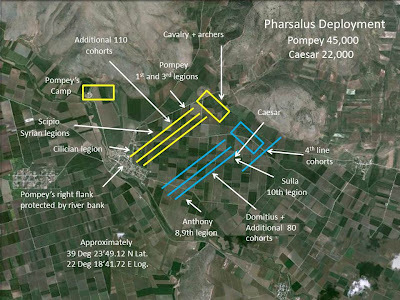 With Pompey settled in Pharsalus, Caesar employed a moveable camp strategy designed to wear down Pompey if he pursued, but Pompey declined. Then, one day, Caesar noticed Pompey’s lines farther down from the mountain and decided to offer battle. 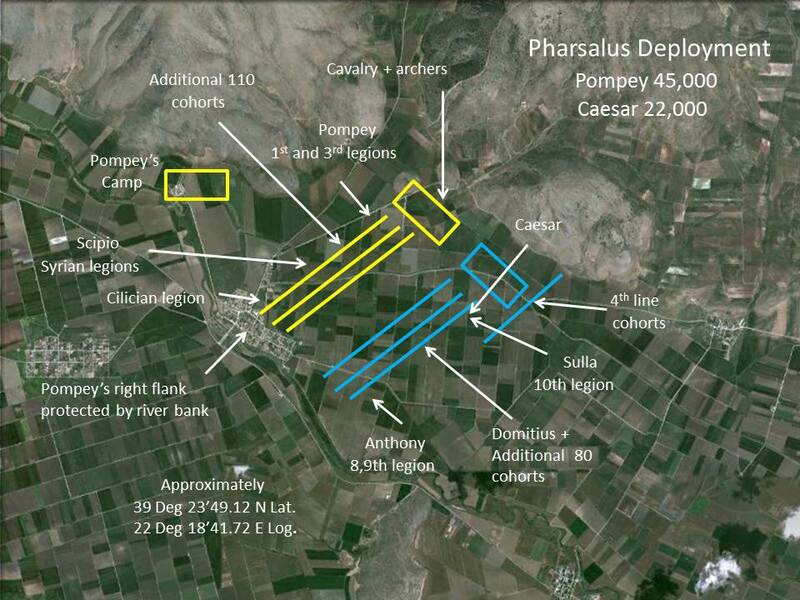 Success for both armies hinged on the cavalry deployed on Caesar’s right (Pompey’s left). Pompey had a huge advantage in cavalry with some 7,000 available to him, including archers, but Caesar recognized this as a key vulnerability and pulled a cohort from each legion to create a “fourth line” of infantry behind the cavalry. Caesar, aware of the importance of timing, told his commanders to watch him and expect signals from the waving of his flag. Pompey, acting on the advice of one of his commanders, decided to have his lines hold position rather than move forward, expecting Caesar’s troops to charge the whole distance and tire themselves out. The latter, consisting of the first two lines, closed half the distance and, observing Pompey’s forces in their initial position, stopped to conserve their strength. Then, after recovery, they renewed their charge until the lines were engaged. Pompey’s cavalry moved forward, forcing Caesar’s troops to give ground. Before they could attack the right flank of his infantry, however, Caesar signaled the fourth line to enter the fray. They fought with such vigor, Pompey’s cavalry took to the hills leaving the archers exposed and they were defeated. At that point, Caesar signaled the third line of infantry forward to relieve the weary first and second lines. This created an opening for the fourth line to encircle the left side of Pompey’s infantry and begin the rout. Pompey, now anticipating defeat, returned to camp and tent to await the outcome. With victory on the battlefield complete, Caesar decided to press his advantage and storm the enemy camp. The camp was taken, but Pompey had escaped by horse to Larissa. His troops attempted to follow but they were intercepted by Caesar and forced to surrender. The Pompeian army of 45,00 yielded 15,000 killed and 24,000 prisoners.